Today's sign shops have needs that are unique to their industry. Restricted floor space, exceptional dust sensitivity and a wide variety of substrates and composite materials of different thicknesses are just a few. 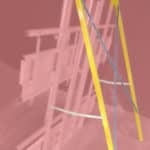 They use cutting-edge materials to stand up to the different environments where their work will be displayed. 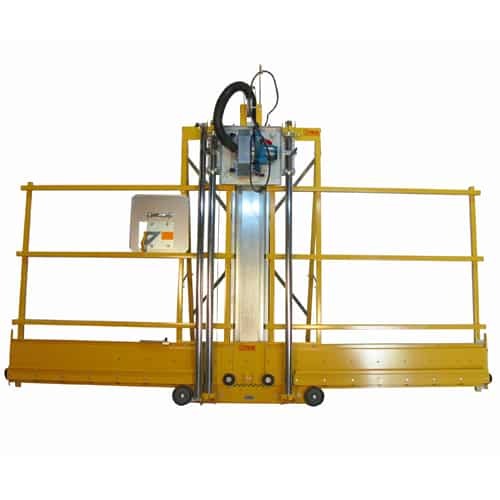 In the past, you needed two cutters, a panel saw for your rigid material and a substrate cutter for your softer material. This arrangement was expensive and took up twice the floor space. Some shops settled for just a substrate cutter. They were limited to what material they can cut, the size blank they could cut, how thick the material they could use and had to settle for only vertical cuts. 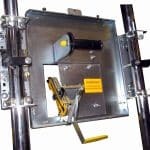 With the Sign Maker Panel Saw and Substrate cutter, sign shops now have one machine for all of their cutting needs; you no longer need to buy a panel saw AND a mat-cutter. 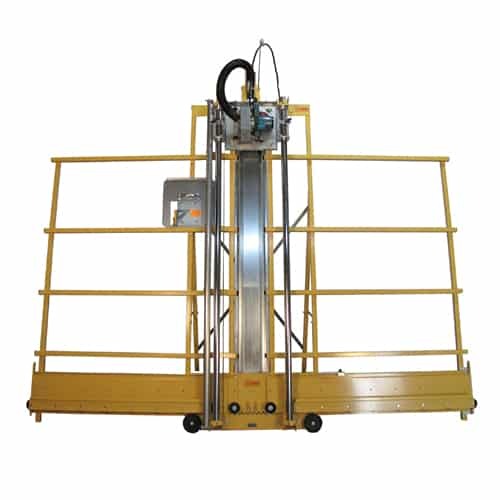 It is equipped with specialty accessories for cutting all of the substrates, hard and soft, used in the sign industry in both directions, vertically and horizontally. 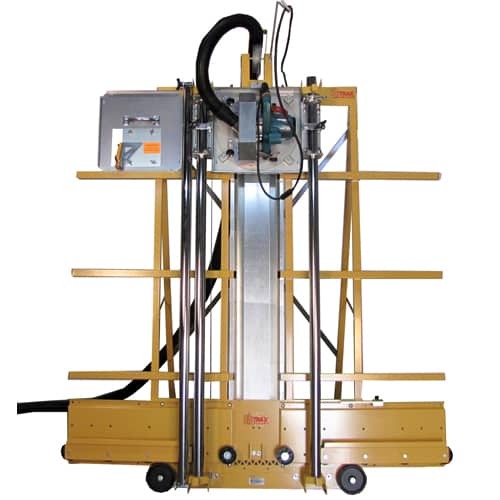 This "all-cutting" substrate cutter is ideal for making precision cuts in sheet goods that are up to 1¾ inches thick. 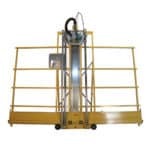 Saw Trax Manufacturing has been focused on making a sign saw for the sign industry for decades. You may be familiar with the Coro-Claw 4 mil corrugate flute cutter, The Coro X 10 mil flute cutter and the Biddi Safety knife. Our Sign Saw and Substrate cutter is the perfect cutting tool for every shop. It is the cleanest cutting panel saw with a dust collection that not only collects the dust, but sweeps the cut on the up stroke. 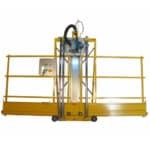 It uses a dust free pivoting knife that cross and rip cuts acrylics, Foam Board, Corrugated Plastics, and score cuts PVC . 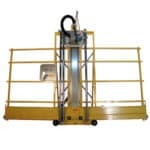 The saw can cut solid aluminum up to 3/8″, aluminum composites, wood composites, acrylics up to 5/8″ and other rigid materials used in the sign industry. 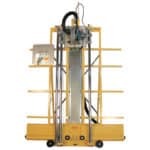 The pivoting OLFA knife can cut 4 mil coro plastic sheets (up to 2 at a time), 10 mil coro plastic sheets, foam boards, composite paper boards and can score cut PVC and Dry Wall. A word from the president of Saw Trax to explain the fine points of their machine with other cutters on the market. If you are thinking about spending several thousands of $$$, you need to hear what he has to say. Sign shops have unique needs that are not found in other shops. They cut many different types of materials, from composite wood sheets, Acrylics, PVC, Corrugated plastics, aluminum and aluminum composite materials (ACM). They are typically very space restricted and very sensitive to saw dust. They need a specialized sign saw that can cut these materials without a lot of dust. Since the needs of today’s sign shop are so specialized, we offer a specialized sign saw that is clean and capable. 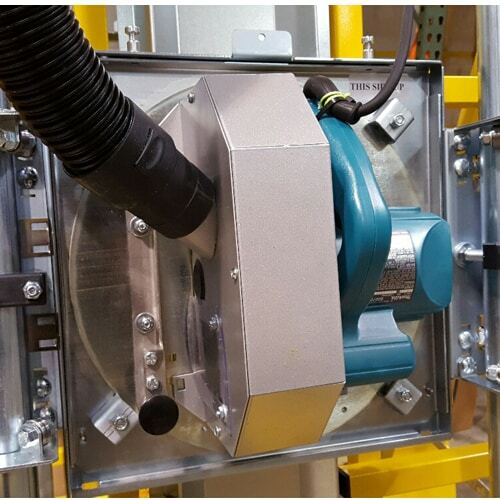 The saw blade is surrounded by a dust brush containing the saw dust that allows the high flow dust hose to evacuate the particulate. The brush even sweeps the cut on the pull back. The pivoting knife insert has variable tension. It can cleanly cut foam boards, 4 mil Coro (even 2 sheets at a time), 10 mil Coro and even score cuts PVC. You can also do horizontal cuts with the knife. Other combination panel saw and mat cutter machines on the market are not as Easy to use, Fast to use, Safe to use or as accurate as our machine and I will explain why. 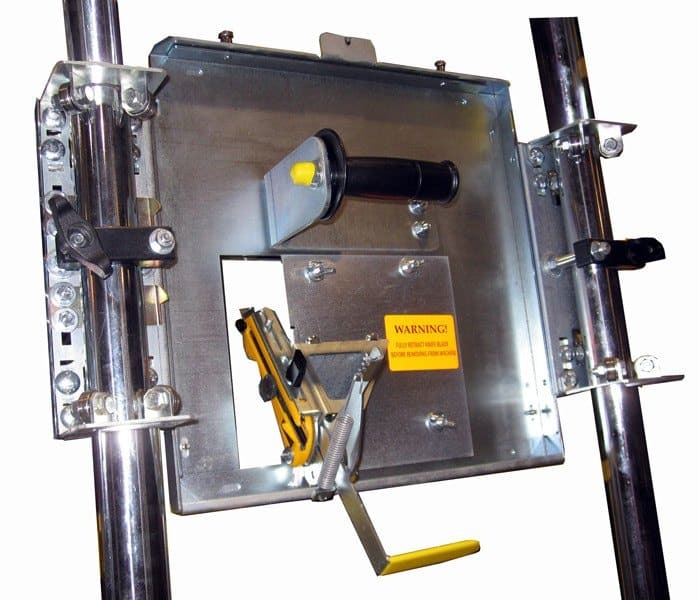 Why are Saw Trax Panel Saws and Substrate cutters easier to use? Our Makita 5007F saw has a built in lighted viewing port in the dust cover, theirs doesn’t. Our saw is off-the-shelf and can be serviced or replaced at Makita service centers or dealers. Their saw is proprietary and is more expensive to replace with longer down times. Our saw uses cheaper and common 7.25″ saw blades. Their saw uses obscure and expensive 8″ saw blades. Our knife pivots for score cutting and can rip cut. Their knife can only cut vertically and doesn’t score cut. Our knife cuts in a specially formed slot in the dust pan that supports the product on both sides of the cut preventing it from pushing back. 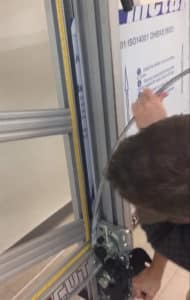 With theirs you have to attach a backer board that is attached with two screws. You have to use a Philips screw driver to hold the screw and reach around to the back of the machine to blindly screw on a wing nut. If you leave it on to cross cut with your saw and then try to rip cut, you will bend the saw tooth and be replacing the saw blade. Our knife uses an OLFA knife with segmented blades so you can sharpen in by snapping off a segment. Their knife uses the old style utility knife blades that has to come out and swapped ends. You only get two “fresh” blade uses instead of multiple “fresh” blades with a segmented knife blade. Our machine has a center support step to support strips so they don’t fall down and bounce into the saw blade after the cut. Theirs doesn’t. 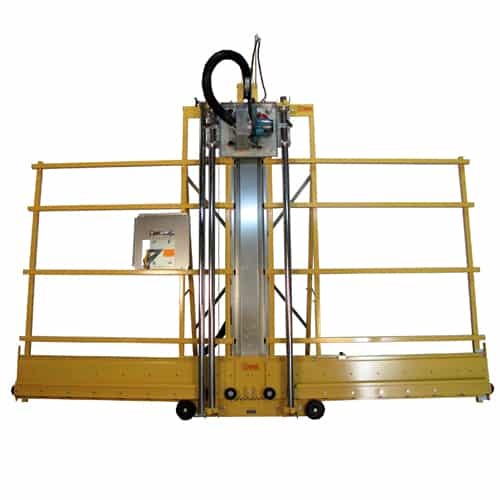 Our stop can be used on either side of the saw and on the optional mid fence. There’s can only be used on the left side. 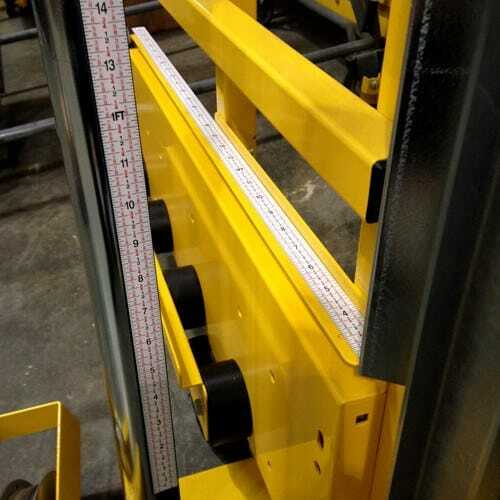 Our stop has a strip bar attachment that allows you to make uniform and repeatable cuts on strips less than 6″. Theirs doesn’t. Our stand folds out like a ladder and is factory attached using 10 lock nuts. Their stand has to be attached by you and uses 2 pieces of angle iron attached with U-bolts and doesn’t use lock nuts. Our frame wheels pivot off the ground when on the stand for stability of the machine while cutting, theirs don’t. 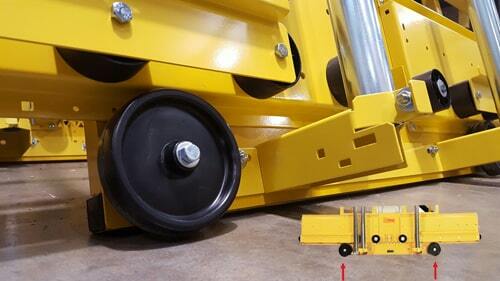 We use 12 sealed steel bearings on our quick release carriage for a smooth pull down. Theirs uses a U-bolt with nylon washers which is not as smooth. 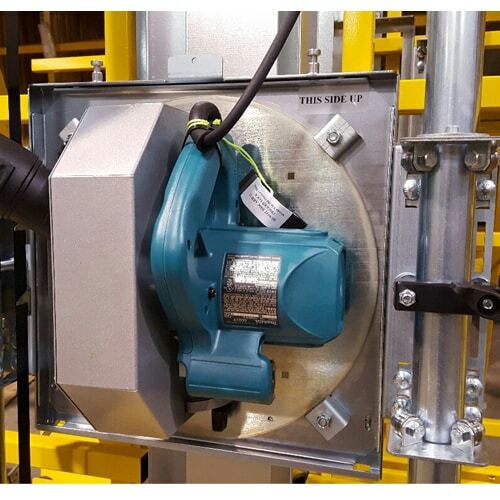 Why are Saw Trax Panel Saws and Substrate cutters are faster and safer to use? Changing from one tool to another is not only faster than any other combo cutter, it is much safer. It is faster because the pins that hold the tool insert in place never come off the machine. They are pulled up and rotated a 1/4 turn and the lock open. The tool is then rotated out and the new tool is rotated in. The pins are then rotated another 1/4 turn and the spring loaded pins seat the new tool insert in place. This process takes about 10 seconds. Other combo machines use knobs that have to be screwed off the machine. What makes this difficult is the Once the new tool is in place, they are screwed back on. It would be simple but these knobs don’t have the hole centered in them so they come back on in an oblong circular motion. Carriage changes take over a minute. Attaching or removing the backer board takes a few minutes. 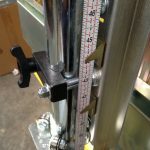 It depends on how fast you can find the screw driver and whether or not you don’t drop the wing nut behind the machine when screwing it on. Our machine is safer because the saw has a blade guard still on it at all times. You can take it off and set it on a table or floor. The OLFA knife blade can retract into the knife so once again you can set it on a table or floor. Their machines don’t have a guard on their saw or the ability for their knife blade to retract. Where do you put them when off the machine? 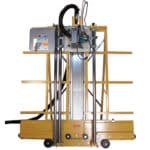 Why are Saw Trax Panel Saw and Substrate cutters more accurate? A number of factors go into what makes a panel saw accurate. 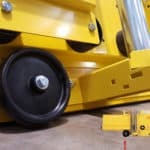 The alignment of the material rollers, the play in the tool carriage and the alignment of the guide tubes to the material rollers are the major factors in getting straight and square cuts. 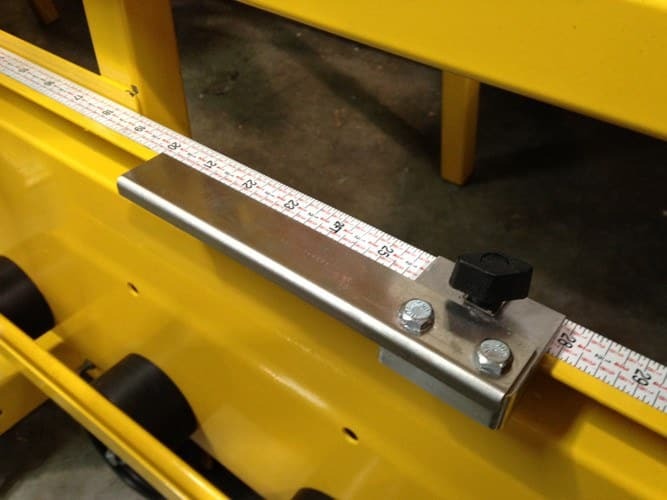 The play in the tool carriage is a factor when cross cutting and rip cutting. 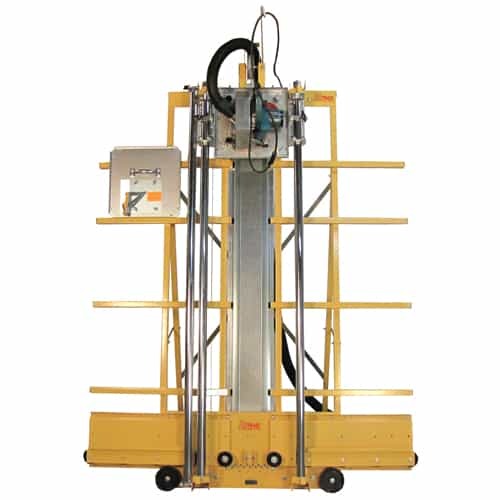 For cross cutting or cutting vertically the saw travels in a carriage on the guide tubes. To have the saw move precisely and smoothly, we use 12 bearings, 3 on each corner of the carriage. For rip cuts when the saw is turned sideways and the material push through it, we have two carriage locks to ensure the carriage is locked in place. 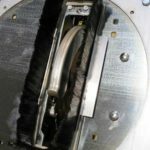 They use a U-Bolt with nylon washers on it for a bearing system. It is very difficult to “tweak” these and there is a compromise of easy movement of the carriage and the play that you can tolerate. For rip cutting they only use one carriage lock so it is possible for the carriage to jiggle on one side. If you are cutting 3 mil Aluminum Composite Materials (ACM), Saw Trax offers options like a rolling ACM cutter that makes dust free cuts with a rounded edge on 3 mil ACM , a sheet clamp that ensures your material does not shift when cross cutting (recommended with the ACM cutter), a floating router for V grooving ACM and a mid-fence for cutting smaller pieces waist high. Other combo machines don’t offer these accessories. 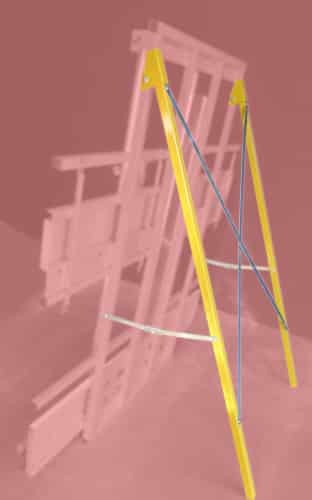 One important difference of the Heavy Duty Saw Trax ACM cutter and the light duty, non-saw substrate cutters is ours doesn’t “noodle” the cut piece rendering it unusable which saves you quite a bit of money in material costs. 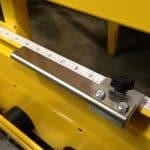 When you couple these features with the only panel saw that will never go out of square and uses sealed steel bearings on a quick release carriage, you can see why a Saw Trax machine is the choice of today’s sign shop owner. If you own and operate a sign shop, there is no better cutting tool than the Saw Trax Sign Maker Panel Saw and Cutter. Contact us today for a dealer near you. Shipping Crated Uncrated. What do you do if it arrives damaged? Folding Stand Folds like a ladder. Takes one person to move. Need two people to fold, one in front to steady machine and one in back to pull and reinsert pin. Blade does not retract dangerous exposed blade off machine. Very time consuming to put on and take off. Alignment System Patented Accu-Square Indexed System; Never goes out of square! Set it & forget it. No Alignment System. 13 adjustment points. 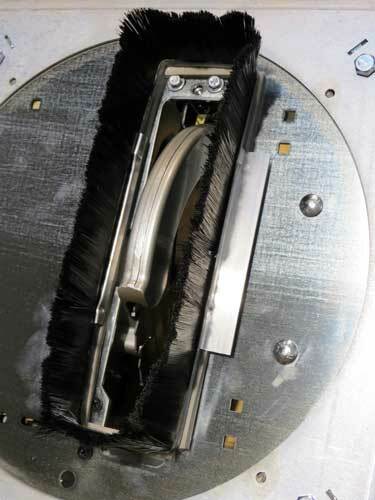 Dust Collection Standard, Dust brush under carriage contains dust, cleans on retraction. $245; No dust brush included, Vinyl tube, must be adjusted constantly for each material of different width. Backer board No need due to unique dust pan design Standard in package. Has to be removed to make rip cuts; can bend saw blade causing the need to replace blade. Very time-consuming to put on and take off.